People just want to feel the burn. And marketers do, too. The booming popularity of pain-inducing endurance sports is driving growth in marketing spend to support it. According to research from Chicago-based IEG, a sponsorship firm and unit of WPP's GroupM, North American sponsorship spending on marathons, triathlons and the like will hit $102.1 million this year, up 6.7% from $95.7 million in 2011. That bests the IEG’s prediction of 4.1% for the overall sponsorship industry and 6.4% for the sports category in general. The reasons, according to IEG: there are more people getting into hitting the wall, a rising interest in health and the affluent spectator demo. Sponsors are doing a range of activations, involving six-figure spending down to smaller backing of grassroots events. Some do both. Nissan has been a consistent sponsor both of major endurance events with global appeal, such as the Amgen Tour of California, of which its 2013 Altima was official vehicle this year, and in which raced a pro-cycling team it co-sponsors with Radio Shack. The automaker, which has been a multi-year sponsor of that race, also backs the ING New York City marathon along with brands like Timex. Nissan also gets behind local amateur cycling and running events tied to its "Master the Shift" platform with partner Rodale Press. IEG also points to Allstate Corp. and the Allstate Life Insurance 13.1 Marathon Series; HumanaVitality, LLC and the Kentucky Derby Marathon; and PNC Financial Services Group, Inc. and the Rock ’n’ Roll Philadelphia Half Marathon. The consultancy also points to the horizontal expansion of endurance sports, such as the advent and growth in popularity of such extreme events as the global Spartan Race series. 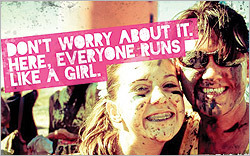 There are also races like The Original Mud Run, which has about 15 sponsors including the U.S. Air Force and Motorola; the Dirty Girl national series, which has three national (Trek, Body Basix and Stark Brothers) and 22 regional sponsors; and Color Run 5K events, of which Chevrolet's Spark sub-compact is the official car. There's even a zombie-themed event, "Run For Your Lives," which comprises around 20 races nationwide and of which Subaru and the American Red Cross (appropriately) are sponsors. William Chipps, senior editor of the IEG Sponsorship Report, tells Marketing Daily that desirability for sponsors isn't necessarily dependent on how traditional it is. "It's the size of the event, how well it's run even if it's new and unique." He adds that overall participation drives the demographic. "Spectators are the icing on the cake; the participants are loyal, and passionate."